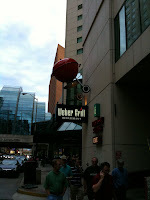 This evening, a group of us from the class went to the Weber Grill Restaurant in the downtown area. 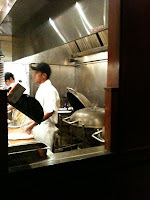 They grill most of their entrees over charcoal on these oversize Weber grills. I first heard about this chain on FoodTV but the kitchen here didn't look as impressive as the one on the show (the hostess said that one was in Chicago). The food was very good. I had a half rack of pork ribs with a salad and it was very good. I did manage to get another three mile run in between the class and walking downtown for dinner. One of the high points (at least for me) is that I ran it continuously in about a half hour. I usually stop running and walk for a bit around 1½ miles but today, I didn't have enough time to walk and still make my three mile goal and, in fact, I was still feeling pretty good by the end that I could've kept going. Including the walk downtown, today was about a seven mile day. Not ten but good enough to make me feel like I did some exercise. Hopefully, I'll be able to get to sleep early tonight. We start again at 9:00 tomorrow morning and run all day. I really need to go through the slides so I am ready to present. I'm not at all happy with how I did today. 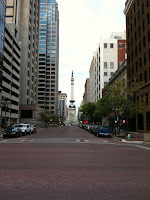 Indianapolis is the capitol of the state and there are some interesting monuments. Here is a view of the traffic circle from the perspective of the capitol building right behind me. There is also a shopping mall near here and located across a couple of blocks and above all the traffic. It seems to cut right through some of the buildings downtown. You can catch a glimpse of it in the Weber Grill picture above. The mall is the huge glassed in area.